A new policy briefing from the Center for Arts Education details the state of the arts in New York City’s public schools, and it’s not looking pretty. According to the report, the schools lost 135 art teachers in the 2009-2010 school year—bringing the system down to 2007 levels after two years of increases in art teachers. Funding for art supplies has decreased as well. As the city is planning to lay of 4,100 teachers in order to shave $269 million off the budget, it’s only likely to get worse for students in the NYC public schools. This news is obviously distressing, and not just because I’m an arts administrator in New York City. What makes this city so great is the culture. I chose to come here to pursue my career in arts administration because of the wealth of cultural riches available in New York. And that doesn’t just attract residents, but tourists as well. 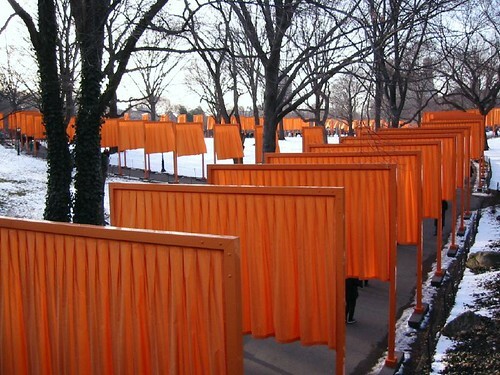 Christo and Jeanne-Claude’s The Gates drew four million people to Central Park during the coldest month of the year back in 2005. The Alexander McQueen exhibition at the Metropolitan Museum is so popular (and crowded) that the museum is charging hiked entrance fees on Mondays for those who want to tour the show in peace while the museum is normally closed. Art and culture were key to the resurgence of Brooklyn, the borough I call home along with millions of other transplants. It’s shameful for a city that heavily depends on the arts to deny art education to its own students. Mayor Bloomberg knows the arts attract dollars. He was the one who helped make The Gates happen back in 2005. And it’s no mistake that the two week public art happening in Central Park occurred in February. In frigid midwinter, after the holiday season but before the spring thaw, tourists may be more likely to avoid New York (and I can’t say I’d blame them—New York in February is pretty brutal). The Gates was savvy way to bring tourists to New York during this typically slow time for tourist traffic, and they succeeded. The free installation generated $254 million in economic activity for New York City. Not too shabby for mid-February. Bloomberg also supports the arts personally; in February his family foundation announced $32 million in funding opportunities for cultural institutions over the next two years. So our Mayor understands the importance of the arts—why can’t he extend this to the schools? As the National Endowment for the Arts has showed us, students who have had an art education are more likely to be cultural patrons later in their lives. Investing in art education now would help the cultural institutions Bloomberg patronizes down the line. Cultural institutions (and, indeed, the city itself) can’t survive on tourist dollars alone. They need local cultural patrons to support them in chilly midwinter, when the tourists aren’t here. But if art education continues to decrease in the NYC schools, those patrons won't be there. Read more about the CAE’s policy brief in the New York Times and the New York Post. And check out pictures from CAE’s rally for art education at City Hall last week here. This is distressing, especially in NYC where the arts are one of the things about the city that make it so inviting. Yes NYC is the place to be. Artists and Jocks - Unlikely Allies?